Last night's episode of Prognosis: Death! Pandemic was pretty gosh darn awesome. The staff of St Love Hospital were sent on a group-bonding summer camp retreat at the St Love Bayou, only to be confronted by a vicious yeti. I'm pleased that the show was so awesome, because I would hate to have caused myself physical harm for something that wasn't totally worth it. It's the one on the right. Of course it happened in the second scene of the night. Nurse Lottie Buble's trait for the evening (a suggestion I get from the audience) was "rage-induced narcolepsy". Basically she'd get so worked up about something, some sort of self-preservation mechanism would kick in and she'd faint dead away. So I start the scene with the rage element - bashing at the hospital bed with Buble's regulation-issue nurses clipboard. I then peel back and take aim at the mattress-y part of the bed. Of course, being Girl Effing Clumsy, I completely f*** up the shot, and crack the top of my foot into a very hard piece of wood. The pain is real. Feel it. Feel it! I had intended to kick the bed and parlay that into a humourous bit of slapstick physical comedy with a faint, but after the intense shock of the kick, all I could manage was a sharp intake of breath, a silent scream and then the line "I missed". It didn't get a laugh. Not surprisingly, as it wasn't funny. CURSE YOU BRAIN FOR NOT BRINGING THE FUNNIES WHEN THE BODY IS IN PAIN. Turns out a lot of people thought I was acting because I recovered reasonably quickly and moved along with the action. I'm going to take that credit. I WAS putting on some brilliant acting. Method acting, sure, but damnit, you take what you can get. 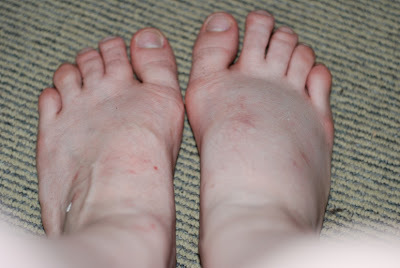 By interval my foot had swollen up like Marlon Brando after a bee sting. The energy and focus on the performance got me through the second half, but once I removed Nurse Buble's shoes after the show finished, I became almost an instant cripple. ... then, damnit, it was totally worth it. There are only two nights of the show left - and a note for the Burgers/Felafel fans out there - bon vivant and playwright Simon Bedak will be in town and coming to the show this Saturday 30 January, and is very excited about meeting people. Book your tickets now! Oww. On the plus side you have classical feet. This is where the second toe is longer than the first, as in all the ancient Greek and Roman statues. My mother (Italian) claims this is a sign of genetic perfection. My father (Anglo) points out this is probably an evolutionary throwback to climbing trees and peeling bananas with one's feet. Just thought you needed to share that. Not that I'm a foot fetishist or anything. But I expect they'll be along any time soon. Nat, OUCH! Hope your planning to RICE that sucker, or maybe even have an X-Ray?. Actually I think it's RICER these days, but I can never remember what the 2nd R is for? Kudos for getting through it though. Damn that was funny and for some reason it tickled my fancy... and lots too. Billy's wheelchair is free now. RICER - Rest, Ice, Compression, Elevation, Referral. I imagine it would be diffcult to do the whole show with your foot above the level of your heart! Upside down in a wheelchair? On a hospital bed with one of those lifted foot rigs? Hey all - went to the hospital today & got an x-ray. Thankfully no broken bones, but have been advised to keep it raised with a compression bandage. I also have crutches. So tonight's "Prognosis: Death! Pandemic" is going to be hella fun... where better to be injured than in a show set in a hospital? Thanks all for your comments; it's really lovely to see the compassion for my physical ineptitude! Mrs. Flannery or any other witch type place should have it. It does wonders for bruising and swelling but never apply it to broken skin. Take that manky foot of yours off for some pin work. 326 Montague Street West End. Do it before your foot turns black and falls off, hey?